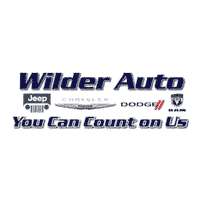 Wilder Chrysler Dodge Jeep Ram is a new and used car, truck, and SUV dealer located in Port Angeles, WA. Wilder is proud to also serve Sequim, Forks, Port Townsend, and the greater Olympic Peninsula. We take pride in our automotive business because its success is a direct result of our commitment to maximizing value for our customers. We want our customers to be the most informed they can be when they go into the car buying process. No matter if our customers are buying a Jeep or getting their Ram truck serviced, we want to make sure they are satisfied with our dealership. Let’s face it: the car buying experience is a big decision. That is why the sales team at Wilder Chrysler Dodge Jeep Ram strives to a hassle free customer experience. Feel free to browse our new and pre-owned inventories of Chrysler, Dodge, and Jeep vehicles. Our full-service dealership is located in Port Angeles, WA, and we strive for every customer to leave satisfied, no matter what automotive service is required. Call us today at ​(360) 207-4927 to learn more.